Meringue, fruit and ice cream make this parfait a berry delight. Line 6 ramekins or a 900g loaf tin with a double layer of clingfilm. Using a handblender blitz half of the raspberries to a puree, then pass through a sieve to remove the seeds. In a separate bowl blitz half the blueberries, and pass through a sieve. In another bowl whip the cream and vanilla together until they form soft peaks. Place the sugar and 2 tablespoons of water into a pan and simmer until the sugar dissolves, then turn up the heat and boil for 2 minutes only. At the same time start to whisk the egg whites in a spotlessly clean bowl until they form stiff peaks, then drizzle the syrup into the egg whites whilst whisking continuously. Keep whisking until the meringue has cooled. Fold the meringue and cream together, then divide the mixture between two bowls. Add the raspberry puree to one bowl and then add the blueberry puree another. Pour the raspberry mixture into the bottom of the ramekins or loaf tin, then freeze for 1 – 2 hours, then remove and layer the mixture with the fruit puree, then top with the blueberry mixture. Return to the freezer for at least 3 hours. 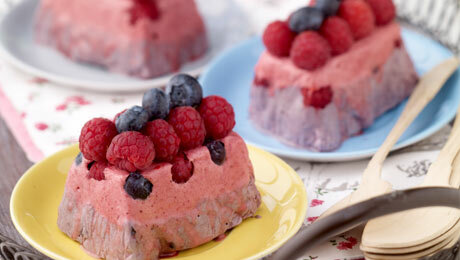 Remove from the freezer half an hour before serving, and serve with some fresh fruit.